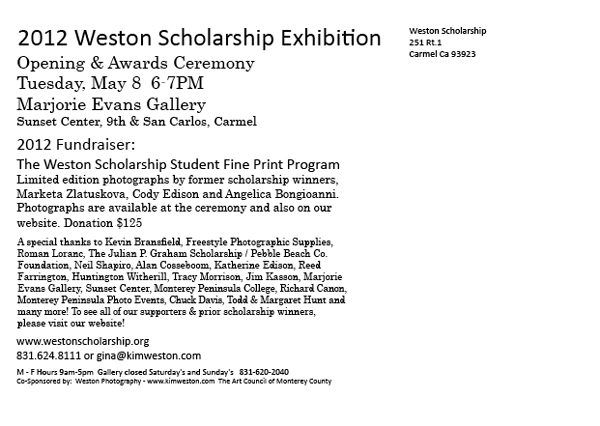 We hope you can join us on TUESDAY MAY 8, 2012, 6-7:30PM for The WESTON SCHOLARSHIP AWARDS EXHIBITION & CEREMONY at The Marjorie Evans Gallery at Sunset Center, 9th & San Carlos St. Carmel CA. Come and celebrate with us! We are hanging the show today. So the show will be open later today!!! Older PostWeston Scholarship has over 100 entries in 2012!